Whether you’re interested in learning to scuba dive, a certified diver looking to advance your skills, or just looking for a great group of people to dive with, Sea Level Scuba welcomes you. At Sea Level Scuba, our focus is on teaching and encouraging safe diving at every level from basic Open Water certifications to advanced Technical Diving. 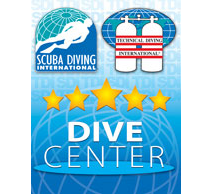 We have experienced, top-notch instructors who work with you to ensure you have the skills you need to dive safely and enjoyably within your certification level. We sell and service a wide array of dive equipment for beginners through Advanced Trimix divers. We can help you select the equipment you need to meet your diving needs and budget without ever trying to push you into buying equipment you don’t need. It’s all about the diving! We run many trips each year, we will usually run at lease one wreck diving trip per month (May-Sept) in the Great Lakes or the St. Lawrence Seaway. We run one and some time two winter trips to warmer waters. We have been to Fiji (2), Bonaire (4), Grand Cayman, Little Cayman (4), Galapagos islands, Mexico (4), Utilia, Bay Islands, Belize (2), Honduras, Solomon islands & Grenada, Curacao (4). Look at our trips page for more info on our trips. SEA LEVEL SCUBA LLC is a NACD (National Association for Cave Diving) facility. We can help with all your needs for cave diving equipment and training. We can advise and help you get set up for your cave diving classes or trips. We can set you up with NACD cave diving instructors for courses, NACD cave diving guides or help you just plan your cave diving trip. We have available all NACD products including cave charts, clothing, books, etc.